How do you store and organize all the tiny, little office supplies you need on hand? There are so many fun and clever items to organize the “little things” in life and our office that are just laying around our homes. For example, use an old muffin pan to store your paperclips, staples and tiny little gadgets. Or use an ice tray or even an egg carton to keep rubber bands and pushpins handy. Think outside of the “ice box” and re-purpose items you already have laying around collecting dust. Grab that old ice tray that just sits empty and put it to work. It will easily fit into any desk drawer. A framed pegboard! Of course, a great way to keep everything organized and did I mention, easily accessible? 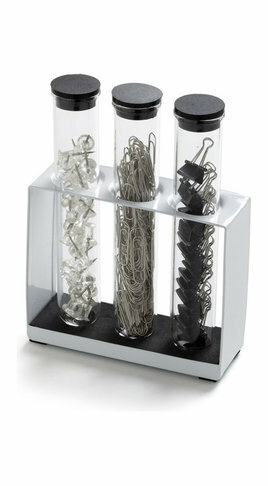 Also frame a piece of sheet metal and use magnetic spice containers to hold buttons, tacks, paperclips, plus much more. Add a ronmatic feel to your office by using antique glasses and dishes to store and organize the simple things. Use “test-tube” glass containers to store items and have fun looking at it! This is what I personally use to organize the “little things” on my desk. It is an Eastern Indian spice rack! It works great for jewelry, beads, crafts and so much more.